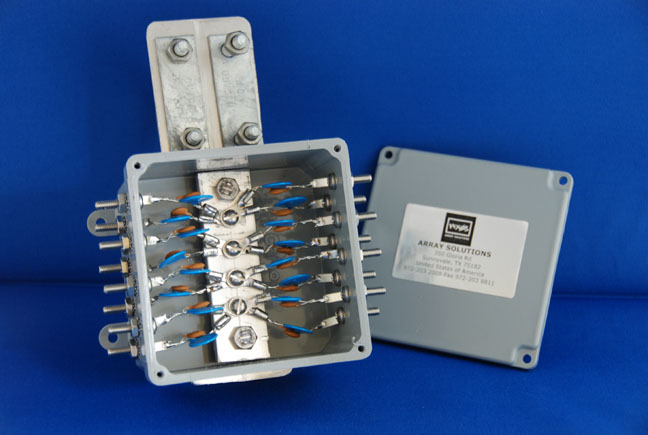 AS-12SP: Surge arrestor for 12 control wires. Needs grounding. 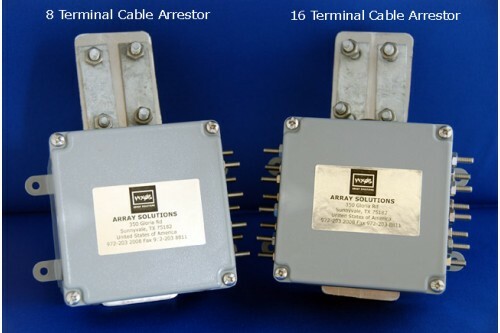 Eight and Sixteen terminal 65V Surge suppressors for control lines and rotators. Ground connection is needed. Interior of Sixteen terminals version shown here. These new arrestors solve the application problem of installation on tower legs or on an entry plate. Easy to install. Unlike the competition, no fabrication is required on your part. Bolt it on the tower leg, make the connections to your control cables and go! Three choices of Suppressors are available depending on your requirements. Eight Wire Suppressors to support typical Amateur Rotator installations. Eight (AS-8SP) or Sixteen (AS-16SP) Wire Suppressors when less or more connections are required. Outside terminals are all Stainless steel. No zinc screw terminals to rust! Mounting bracket mounts with two galvanized U-bolts so it will not twist on a tower leg, and makes a very high current attachment point. The box is a certified NEMA 4X ( harsh chemical environmental certified box) - will not corrode and has a rubber seal. Components are easily replaced by customer if necessary. All components are secured with mechanical and soldered connections to handle large currents. Each terminal uses componetry selected to handle 6,500 amps of surge current -and will fire at 65 Volts. Each lead is RF Bypassed to eliminate RF Interference on your control lines which results in more stable operation of your control boxes. Two element Vertical Array Controller for 40 m band. In phase the pattern is bi-directional perpendi..
Two element Vertical Array Controller for 80 m band. In phase the pattern is bi-directional perpendi..
Two element Vertical Array Controller for 160 m band. In phase the pattern is bi-directional perpend..
LP1101-2800* Surge Arrestor, M-F ground lug PL-259/SO-239, 3600 Watts ..
Pro.Sis.Tel PST 641D rotator without controller. Wind area: 1.2 m2 (12.9 sqft). Vertical load: 3..
Pro.Sis.Tel PST 641D rotator with controller. Wind area: 1.2 m2 (12.9 sqft). Vertical load: 850 ..
Pro.Sis.Tel PST 2051D rotator without controller. Wind area: 2.5 m2 (26.9 sqft). Vertical load: ..
Pro.Sis.Tel PST 2051D rotator with controller. Wind area: 2.5 m2 (26.9 sqft). Vertical load: 650..
Pro.Sis.Tel PST 61D rotator without controller. Wind area: 3.9 m2 (42 sqft). Vertical load: 850 ..
Pro.Sis.Tel PST 61D rotator with controller. Wind area: 3.9 m2 (42 sqft). Vertical load: 8..
Pro.Sis.Tel PST 71D rotator without controller. Wind area: 8.8 m2 (94.7 sqft). Vertical load: 10..
Pro.Sis.Tel PST 71D rotator with controller. Wind area: 8.8 m2 (94.7 sqft). Vertical load: 1000 ..
Pro.Sis.Tel PST 110 rotator with controller. Wind area: 10 m2 (107.6 sqft). Vertical load: 1200 kg..
Ring Rotator to install around the tower. Brackets to handle 12" (30 cm) face to 20" (52 cm) face to..